We released two years of this magazine’s comics before we had this blog, and this one took us awhile to finish, so this marks it’s first appearance here. Hopefully the rest will come in a more rapid succession. So, here it is: Do the Mario! Anyway, this release is all the comics from the German edition of Club Nintendo magazine from 1993. 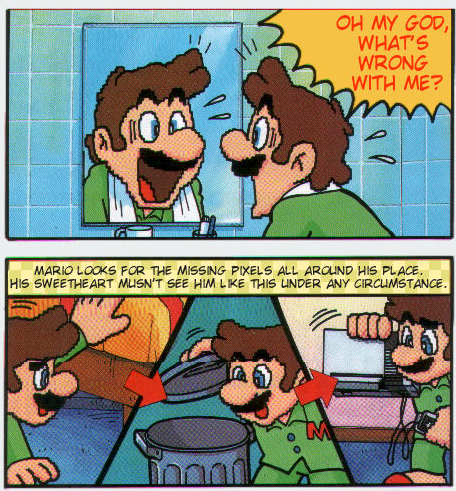 We’ve got Mario asking for help with a medical problem from Dr. Light, who seems to want to de-interlace him; Mario’s attempt at a career in music; Mario being called in for (GASP) actual plumbing work, only to fall into an Oz dream; Mario and pals going on a budget vacation; and Mario unwillingly traveling through time to visit other videogames. Featuring appearances by Joe & Mac and the Lost Vikings. Yeah it does. In the issue where Mario is actually pixelated, the moire was so strong that I thought the yellow boxes where checkerboards, and thus did them as if they were.